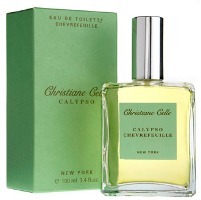 Calypso Chevrefeuille is my second favorite honeysuckle fragrance, after Annick Goutal Le Chèvrefeuille. The notes for the Chevrefeuille are bergamot, orange blossom, honeysuckle, amber and musk. Calypso's Chevrefeuille starts with a sharp burst of bergamot, and calms to a very soft, summery blend of orange blossom and honeysuckle. It is less of a soliflore than the Annick Goutal, and the brightness of the floral notes is tempered by the amber and musk, so this is a warmer, softer, slightly sweeter fragrance, with just a touch of green. It is a very pretty fragrance, and the lasting power is good. I have tried layering the Calypso with the Annick Goutal, but the result was surprisingly unpleasant, like a high school chemistry experiment gone bad. The Calypso line is reasonably priced (about $50 for 100 ml). For availability, see the listing for Calypso under Perfume Houses. Have a favorite honeysuckle perfume? Please comment! This was my HG last summer. I still love it, though I'm almost at the end of the bottle. The scent is so associated with last summer (which was a good time), though, that I won't be buying another. You have to move forward. I also quite like Santa Maria Novella's Caprifoglia, though it is about as light as a scent can be and still be smellable. And it doesn't really smell like honeysuckle, either, though it is very, very pretty. Red Flower has a honeysuckle lotion (and maybe other products) that is pretty true to the flower. I found Caprifoglia pretty but “flat” if you know what I mean. I would love it in a shower gel though. I would love in general to get more of their shower gels, they are lovely. Oh, I didn't know they have shower gels! Yeah, that would be nice, wouldn't it? Btw, just noticed your question yesterday about my feet. I'm walking well, though not at my usual breakneck pace. Even did 45 min on the elliptical machine yesterday. No running or the like for a couple of months.Can't dig with a shovel. That kind of thing. One downside is that I have a bunch of cocktail parties coming up and can't wear pretty shoes. Indigo silk outfit and black Mephisto Mary Janes—not a good look. Thanks for asking, you old sweetie. The only shower gel I have is the witch hazel, and it is wonderful. I don't know how many scents they have though! R, I've been lurking here until now, but seeing that we share the same two favorite honeysuckle frags pushed me to register and post! I have yet to finish a perfume bottle and not want to replace it immediately, so I guess I am unevolved too! I'm trying to save the Calypso for the full heat of summer, which is when it smells best, but I cheated last week — broke it out of my perfume cabinet and added it to the lineup on my dresser. As soon as I spritzed it, I got a silly grin on my face! That's the delightful effect this scent has on me. I have ordered this even though I am retired as a perfume purchaser for several months. I’m saving for a 2ct pendant and I have over 150 bottles collected all this year. Niche to Neimans. I’ve got it all and this probably isn’t the place but I ordered Commes des Garçons, Eau du parfum. It smells like wet tobacco and there is no flower, fruit, or wood, it’s just damned terrible. Luckily I have a smart supplier that is looking out for the customer, they send a vile for you to whiff before you break open the box of juice. It’s going back, I don’t know who would like this. I’m posting something under the scent page for it. I’m getting my all time favorite Parfums di Nicolai’s SACRBLEU. Cannot wait for that just knowing there are two bottles in the house. That’s my signature but I have so much I don’t want to waste it. It’s a disease. Help!